Fire, communications, historicity, atheist registry, homeschooling, charities, drumming, science news and more! House fire - At least Dude is okay. How to Talk to Your New Age Relative - A pamphlet with sage advice for fresh skeptics. Is this the best you got - Non-challenging questions from a theist parrot. Poe? Preacher wants Registry for Atheists - Equating atheists with criminals and other bad people. Review of 101 Reasons Why I'm a Homeschooler - Homeschooling or unschooling? Skeptics and Charitable Giving - How do you contribute? Perhaps Charity Navigator will help. Editor’s Choice: Drummer wanted - A band loses its drummer to Christianity. e! Science News — e! 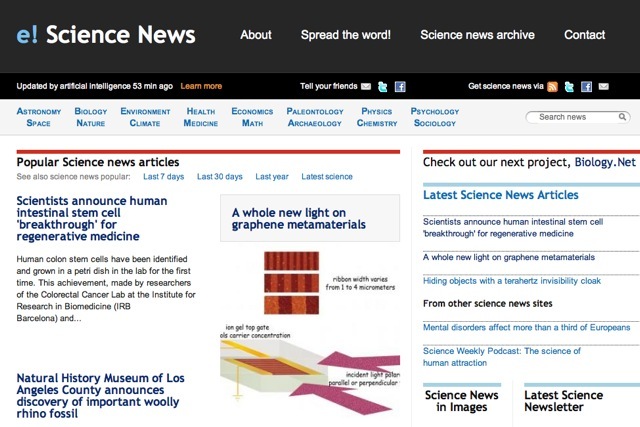 Science News is a no-frills popular science news site that updates almost hourly. It’s a great source for staying current in any area of science that interests you. The articles are culled from all of the most important science news sources that exist on the Internet. And it’s all done automatically. What that means is that the content is fresh. If it was reported today, it’s on e! Science News today. There is no human editor behind e! Science News; it is powered by the e! news engine, a fully automated artificial intelligence. It computes relationships between science articles and news found on the web using a vector space model and hierarchical clustering. It then automatically determines in which category each news item belongs using a Naive Bayes classifier. Finally, it examines multiple parameters (such as timeliness, rate of appearance on the web, number of sources reporting the news, etc) for each news group. The result is an e! score which represents the relative importance of a news item. Thanks to e! Science News, you now have a smart way to keep up to date with fast-evolving science! e! Science News was built and is maintained by Michael Imbeault, PhD student in Retrovirology & Bioinformatics. The site is not affiliated with any linked-to publications or sites. Pretty cool, eh? Not that I have any idea of how all of that stuff works, but apparently it does, and it does it well! You can also get your news from: Last 7 days, Last 30 days, Last year, and the Latest science news. There’s a search engine for specific news articles or areas of interest. 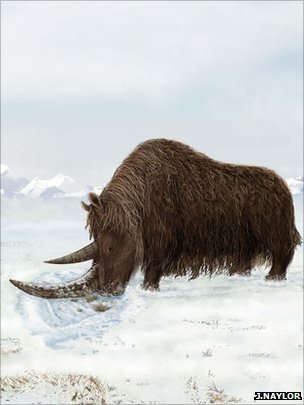 I ran a search on fossils and came up with 100 pages of results starting with the most recent article which happened to be about discovery of an important woolly rhino fossil, which you have probably heard about. Well… At least I have, using e! Science News as my source. Please check out e! Science News, bookmark it, and go there often! Wednesday, August 31st: Chat started out with Dr. Mabuse bitching about one of his favourite discussion forums (next after Skeptic Friends Network and Skepticality of course) was hacked and severely vandalised. The question popped up, how secure are medical records files on hospital computer systems? More health-care discussion ensued, which eventually evolved into capitalism versus socialism. Terry got crank phone calls, but none of us managed to figure out who it was. We don’t think it was HP though, which decided to bail out of the home computers market. Chat ended earlier than usual, but it was sweet none the less. Wednesday, September 7th: Chat started out with someone losing both money and a woman but was hopeful to recover. Then making plans to a joint meet with humanists at some pub at Mesa, AZ. We had some talk about car sales and other car-related stuff. Then R2D2-type air-conditioning not cooperating fully, speaking different languages. Kil complained about coming down with a fever and got a barrage of suggestions which reminded us of his Kil Report on a cold. The chat ended with tips on how to save buying food at the store, before closing the chat a little earlier than usual. Can Teachers Criticize Creationism in Class? I Can Dress Myself, Thank You. Skepticality #164 — Can YOU see the Gorilla? The Cult of Alien Gods: H.P. Lovecraft and Extraterrestial Pop Culture, by Jason Colavito. There were 6,266 daily visitors this week. There were 26,766 daily visitors in August, 2011.